The text was long. The night was cold. 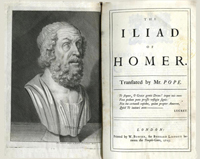 But that didn’t prevent nearly 100 classics lovers from gathering by the lake the night of May 23 to read Homer’s Iliad out loud, under the stars, illuminated by electric candles and warmed by blankets and sleeping bags. “It was a magical experience that only a participant could fully understand,” said Tyler Bolden ’16. Attendance at the marathon reading peaked at about 100 people between 1 and 2 a.m. Those who stayed even later were treated to meteor showers — a most propitious event. “The shooting stars were a sign that the Olympian gods favored our undertaking,” surmised Francesca Tataranni, a senior lecturer in classics and organizer of the event. Hartsock, the final reader, left the podium at 5:07 a.m. According to Tataranni, the moments that followed were “the most magical” of what was already an awe-inspiring night. That’s when the 25 remaining individuals defied the 40-degree temperatures and stared in silence at the horizon after the seven hours of reading. And so, with body and soul fulfilled, The Iliad by Moonlight came to an auspicious and nourishing end.